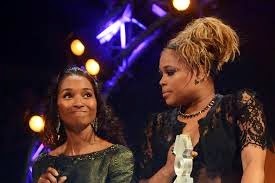 2/3 of 90's girl group (Chilli and Tboz),TLC, have apparently been going through a pretty rough patch that they had to beg solicit for funds from the public in a bid to raise money for the production of their last studio album together. There is a bright side to all this though. The artists hoped to raise $150k, but surpassed their target by raising over $170k in less than 2 days. I guess this proves they are still popular. Here is hoping they make commercially accepted, good music.